If you use cannabidiol (CBD) for pain relief or muscle inflammation, or to help you relax or sleep, CBD-infused bath bombs are an effective and enjoyable way to reap the benefits of CBD. 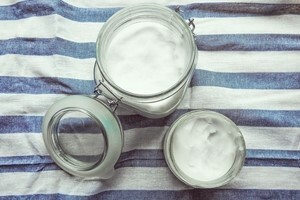 This article has a recipe for how to make CBD bath bombs at home as well as a store bought recommendation. You use a CBD bath bomb in the same way you would any bath bomb. Run a warm bath to a temperature that you find comfortable. Once the bathtub is filled, drop in your CBD bath bomb. Then relax and enjoy your bath! To maximise the full effects of the CBD, we recommend staying in the bath for at least 25 minutes. There are a couple of advantages to making your own CBD bath bombs. For one, you’re able to adjust the dosage of CBD per bath bomb for your specific needs. Second, many people find it more cost effective to make their own bath bombs. Here’s a recipe for making your own CBD bath bomb. This recipe makes enough for two bath bombs containing approximately 100mg of CBD each. Use our CBD oil dosage calculator to work out how many drops of your CBD oil are needed for a total amount of 200mg. Mix the dry ingredients (baking soda, corn starch, citric acid and salt) in a bowl, whisking to remove any clumps. Melt the coconut oil so that it’s liquid, either heat it lightly on a stove top or put it in the microwave for a brief period. Then, mix the melted coconut oil with the other liquid ingredients. Gradually whisk the liquid ingredients into the dry ingredients. If the mixture begins foaming, pour in the liquid more slowly. The mixture should be just moist enough to be able to be clumped together in your hand. If it’s slightly too dry, add a little more water. You don’t want the mixture to be too wet. Fill each side of the bath bomb moulds with mixture so that they’re slightly overflowing. Then press the two sides of the bath bomb mould together. Gently take off the top half of the mould, and leave the bath bomb to dry out a little, sitting in the bottom half of the mould. Once it has dried a little, carefully turn the mould upside down so that it is sitting on the uncovered side, and remove the top half of the mould. Leave the bath bombs out to dry overnight. Store them in a dry place until you’re ready to use them! If you’d rather leave it to the professionals, we recommend the bath bombs from CannaBomb, which are handmade in Portland, Oregon. Their bath bombs all contain doses of 100mg of CBD, and come in a range of different flavours, including Jasmine, Lavender, Coconut-Lime, Sour Tangine, Cyprus Essential Oil and Rose Oil. Warm baths on their own can help to heal muscles. The prolonged heat from soaking your muscles in warm water dilates blood vessels and promotes blood flow, which in turn allows tight muscles to relax. 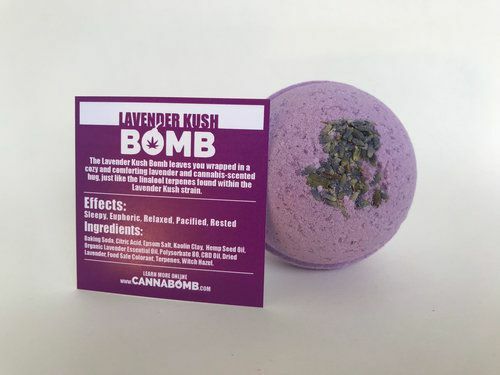 A CBD-infused bath bomb will elevate these effects, as CBD is a natural painkiller. Many sports players treat injured muscles with ice baths to reduce inflammation. Following an ice bath by using a CBD bath bomb in a warm bath could significantly enhance the effects of this practice, as CBD is also renowned for its anti-inflammatory properties. Warm baths can be equally good at improving our moods. Relaxing in a hot tub with a CBD bath bomb will also enable you to enjoy the calming and anti-anxiety effects of CBD.